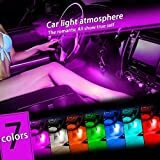 New generic 4in1 car charge 3 LED glow decorative lights. This is about one set of pink decorative light, including 4 pieces lights and one cigarette lighter. Double-side adhesive tap available for easy installation with 360 degree for adjusting. Simple design for your car a beautiful, exotic and romantic interior. LED Quantity: 4*3 LED Lamps. Size: Each light is approx 6cm long and has about 2m long total cable.